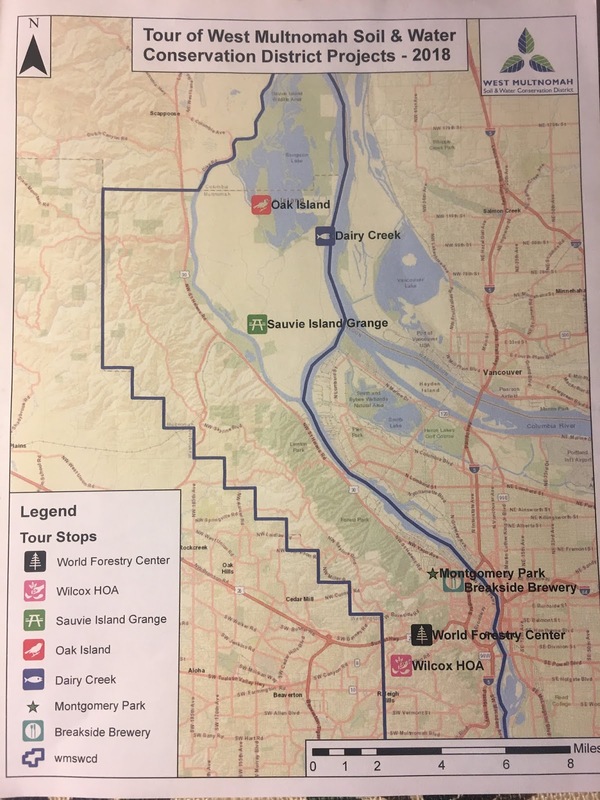 Staff from the West Multnomah Soil and Water Conservation District (WMSWCD) led the World Forest Institute (WFI) International Fellows on a day-long study tour to see habitat restoration and conservation in action at several project sites within the Portland Metro area. 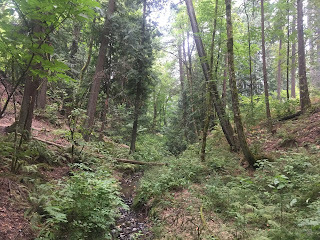 The first project site we visited was the Wilcox Estates Homeowner Association (WEHOA) forest and stream restoration site in the West Hills of Portland. The project covers 7.2 acres of a forested ravine and is led by Margaret and Mike Schonhofen, John Long, Victoria Vining-Gillman, and Karen Suher. The work is actively supported by the WEHOA Board, an HOA comprised of 152 homes. 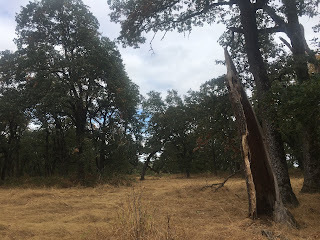 The land being restored is an important drainage in the area and part of the larger headwater system draining to the Tualatin River. The native shrubs and trees that have been planted support wildlife, absorb and slow stormwater runoff, and provide natural filtration which enhances the local waterways. Restoration planning began in September 2012 and gained momentum with a $10,000 grant from WMSWCD for contractor services to eliminate invasive species and plant native shrubs and trees. in January 2013. Mary Logalbo, Urban Conservationist for WMSWCD developed the Conservation Plan for the project, and the grant was increased to $18,000 as the project expanded to include most of the bordering properties. WMSWCD annually monitors the site and provides maintenance recommendations. 4) Providing recreational opportunities for hunters, anglers, and wildlife viewers. We met with Kasey Scrivens from Oregon Department of Fish and Wildlife to learn about efforts to restore oak savannah habitat, of which 99% of the historic range has been lost. 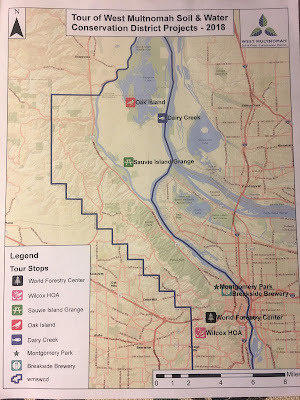 We also met Pat Welle from Scappoose Bay Watershed Council, who gave us an overview on Conservation Opportunity Areas and the "Sauvie Island Plan." Finally, we visited the Sturgeon Lake/Dairy Creek Restoration Project site, where Scott Gall, Rural Conservationist with WMSWCD, explained to us the project's benefits to salmon and waterfowl. 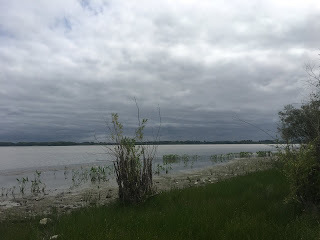 Sturgeon Lake is approximately 3,000 acres of open water and wetland habitat that is critical to the production and protection of waterfowl and other wildlife species, including migratory salmonids, many of which are listed under the state and federal Endangered Species Act. 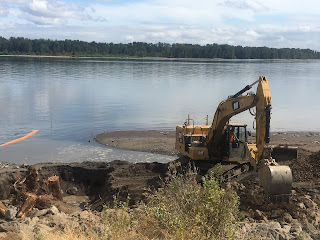 Due to levee construction which has altered the natural hydrology, Sturegon Lake is silting in. 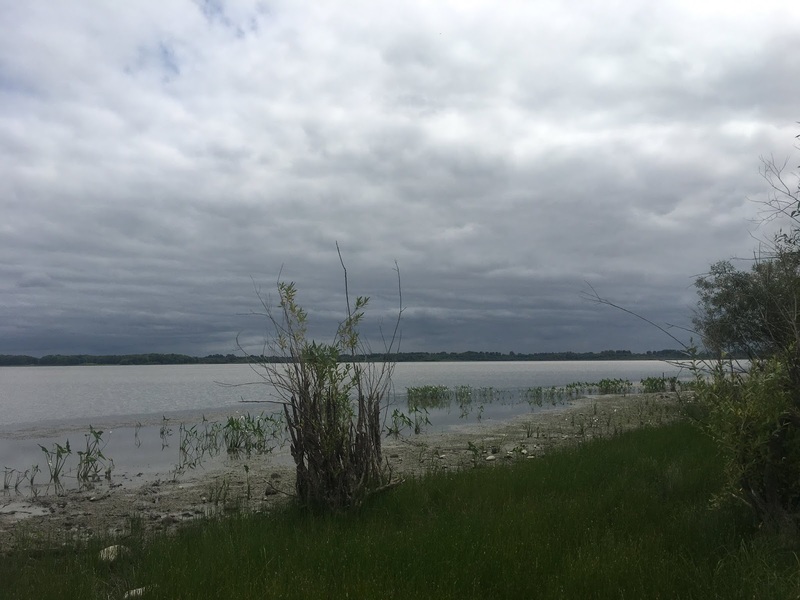 There has been an ongoing effort to restore water movement and reduce sedimentation in Sturgeon Lake. WMSWCD is helping to develop a plan to monitor future sediment build-up, unwanted debris accumulation, water flow, water temperature, and presence of invasive species. WMSWCD will take ownership and maintenance responsibility of an irrigation pipe that passes through the Multnomah County road right-of-way and also take ownership of the project's debris boom at Dairy Creek's confluence with the Columbia River. WMSWCD is also responsible for maintaining a project Stewardship Fund for the purpose of funding any specialized maintenance activity, including repair and replacement of the debris boom.